Dec. 7, 1941, was one of the worst days in America's history — but it was the first of many great days for Americans. One who showed greatness that day was a young black sailor from Speegleville. Whereas the Japanese stood victorious in an air raid that lasted nearly an hour, that sailor rose above his shadowed image — that of a mess mate — and displayed heroism. So did his comrades aboard the USS West Virginia as it was attacked by bomber planes. That mess mate was my uncle. Doris Miller (also called Dorie in the Navy) not only showed his true worth and value in the United States Navy aboard that ship but in subsequent assignments. 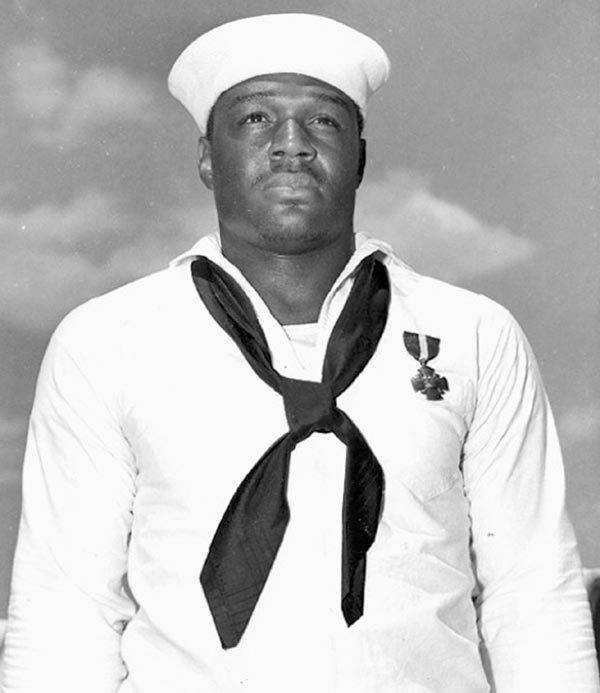 When Pearl Harbor was attacked, running was likely the furthest thing from Doris Miller 's mind, though at the moment he was performing the menial task of collecting officers' laundry. A fight had begun. He had never run from one. As Japanese planes zoomed in, bombing and firing away at the West Virginia, he put himself on the line. He rescued several comrades and pulled his wounded captain out of the range of fire. He had been a fighter all his life, boxing and wrestling with his brothers and neighbor boys. After his enlistment he became the heavyweight boxing champ aboard the USS West Virginia. So there was fight in Doris when flames licked the bridge of his ship. His adrenaline was racing as he acted to defend America by manning a .50-caliber machine gun where other comrades, already gunned down, lay dead. He manned the gun. With aim fueled by anger, he fired at the soaring planes, targeting them as he had squirrels and other varmints in the wild surrounding his family's farm near Lake Waco. His shots struck several planes. He fired until he exhausted his rounds and the order "Abandon ship! Abandon ship!" entered his senses. When he released his hold on the machine gun, he climbed off the ship using the chain of a crane. Other means of escape were blocked. He later expressed disappointment that he hadn't been allowed to fight longer. Though some of the planes he targeted went down, he could not know how much success he had in defending his ship. Similarly, he had no idea how his heroic actions that day would bring changes to the United States Navy. He died later in the war, going down with the ship USS Liscomb Bay. Hence, he never got to see many of the changes inspired in large part by his actions. What he did helped open doors for advancement of and better opportunities for blacks in the military. His name is firmly implanted in American history and the annals of the United States Navy. He was recognized in many ways: the Navy Cross, Purple Heart, Good Conduct Medal, American Defense Medal with Fleet Clasp, Asiatic-Pacific Campaign Service Medal, World War II Victory Medal. Yet, one award remains long overdue: the Medal of Honor. Early on, while the war still raged, supporters in Congress authored and passed a bill — the Mead-Dingell bill —to break the color barrier for those eligible for the military's highest battle honors. Yet the Medal of Honor is the one due honor yet to be awarded to Waco's famed World War II hero. During Black History Month as we reflect on great deeds, and as we celebrate the election of America's first black president, we should remember how trailblazers like Doris Miller made so much possible. But it wasn't for his glory that my uncle put up a fight. He gave of himself so that all Americans might live in freedom. Vickie Gail Miller of Midland is the niece of war hero Doris Miller.